(NaturalNews) TalkNetwork.com's Pete Santilli is streaming LIVE right now from Oregon, covering the Hammond family constitutional crisis situation as it unfolds. The Hammond family is being wildly victimized by the federal Bureau of Land Management (BLM), threatened with five years of prison time for setting a controlled burn brush fire on their own land that accidentally spread to some abandoned acreage of BLM. Pete Santillis is a popular anchor on Talknetwork.com, the online radio network I co-founded in the interests of free speech. (aa) The Harney Basin (were the Hammond ranch is established) was settled in the 1870's. The valley was settled by multiple ranchers and was known to have run over 300,000 head of cattle. These ranchers developed a state of the art irrigated system to water the meadows, and it soon became a favorite stopping place for migrating birds on their annual trek north. (ab) In 1908 President Theodor Roosevelt, in a political scheme, create an "Indian reservation" around the Malheur, Mud & Harney Lakes and declared it "as a preserve and breeding ground for native birds". Later this "Indian reservation" (without Indians) became the Malheur National Wildlife Refuge. (a) In 1964 the Hammonds purchased their ranch in the Harney Basin. The purchase included approximately 6000 acres of private property, 4 grazing rights on public land, a small ranch house and 3 water rights. The ranch is around 53 miles South of Burns, Oregon. (a1) By the 1970's nearly all the ranches adjacent to the Blitzen Valley were purchased by the US Fish and Wildlife Service (FWS) and added to the Malheur National Wildlife Refuge. The refuge covers over 187,000 acres and stretches over 45 miles long and 37 miles wide. The expansion of the refuge grew and surrounds to the Hammond's ranch. Being approached many times by the FWS, the Hammonds refused to sell. Other ranchers also choose not to sell. (a2) During the 1970's the Fish and Wildlife Service (FWS), in conjunction with the Bureau of Land Management (BLM), took a different approach to get the ranchers to sell. Ranchers were told that, "grazing was detrimental to wildlife and must be reduced". 32 out of 53 permits were revoked and many ranchers were forced to leave. Grazing fees were raised significantly for those who were allowed to remain. Refuge personnel took over the irrigation system claiming it as their own. (a3) By 1980 a conflict was well on its way over water allocations on the adjacent privately owned Silvies Plain. The FWS wanted to acquire the ranch lands on the Silvies Plain to add to their already vast holdings. Refuge personnel intentional diverted the water to bypassing the vast meadowlands, directing the water into the rising Malheur Lakes. Within a few short years the surface area of the lakes doubled. Thirty-one ranches on the Silvies plains were flooded. Homes, corrals, barns and graze-land were washed a way and destroyed. The ranchers that once fought to keep the FWS from taking their land, now broke and destroyed, begged the FWS to acquire their useless ranches. In 1989 the waters began to recede and now the once thriving privately owned Silvies pains are a proud part of the Malheur National Wildlife Refuge claimed by the FWS. (a4) By the 1990's the Hammonds were one of the very few ranchers that still owned private property adjacent to the refuge. Susie Hammond in an effort to make sense of what was going on began compiling fact about the refuge. In a hidden public record she found a study that was done by the FWS in 1975. The study showed that the "no use" policies of the FWS on the refuge were causing the wildlife to leave the refuge and move to private property. The study showed that the private property adjacent to the Malheur Wildlife Refuge produced 4 times more ducks and geese than the refuge did. It also showed that the migrating birds were 13 times more likely to land on private property than on the refuge. When Susie brought this to the attention of the FWS and refuge personnel, her and her family became the subjects of a long train of abuses and corruptions. (c) In August 1994 the BLM & FWS illegally began building a fence around the Hammonds water source. Owning the water rights and knowing that their cattle relied on that water source daily the Hammonds tried to stop the building of the fence. The BLM & FWS called the Harney County Sheriff department and had Dwight Hammond (Father) arrested and charged with "disturbing and interfering with" federal officials or federal contractors (two counts, each a felony). He spent one night in the Deschutes County Jail in Bend, and a second night behind bars in Portland before he was hauled before a federal magistrate and released without bail. A hearing on the charges was postponed and the federal judge never set another date. (d) The FWS also began restricting access to upper pieces of the Hammond's private property. In order to get to the upper part of the Hammond's ranch they had to go on a road that went through the Malhuer Wildlife Refuge. The FWS began barricading the road and threatening the Hammonds if they drove through it. The Hammonds removed the barricades and gates and continued to use their right of access. The road was proven later to be owned by the County of Harney. This further enraged the BLM & FWS. (e) Shortly after the road & water disputes, the BLM & FWS arbitrarily revoked the Hammond's upper grazing permit without any given cause, court proceeding or court ruling. As a traditional "fence out state" Oregon requires no obligation on the part of an owner to keep his or her livestock within a fence or to maintain control over the movement of the livestock. The Hammonds intended to still use their private property for grazing. However, they were informed that a federal judge ruled, in a federal court, that the federal government did not have to observe the Oregon fence out law. "Those laws are for the people, not for them". (f) The Hammonds were forced to either build and maintain miles of fences or be restricted from the use of their private property. Cutting their ranch in almost half, they could not afford to fence the land, so the cattle were removed. (g) The Hammonds experienced many years of financial hardship due to the ranch being diminished. The Hammonds had to sale their ranch and home in order to purchase another property that had enough grass to feed their cattle. This property included two grazing rights on public land. Those were also arbitrarily revoked later. (h) The owner of the Hammond's original ranch passed away from a heart attack and the Hammonds made a trade for the ranch back. (i) In the early fall of 2001, Steven Hammond (Son) called the fire department, informing them that he was going to be performing a routine prescribed burn on their ranch. Later that day he started a prescribed fire on their private property. The fire went onto public land and burned 127 acres of grass. The Hammonds put the fire out themselves. There was no communication about the burn from the federal government to the Hammonds at that time. Prescribed fires are a common method that Native Americans and ranchers have used in the area to increase the health & productivity of the land for many centuries. (j) In 2006 a massive lightning storm started multiple fires that joined together inflaming the countryside. To prevent the fire from destroying their winter range and possibly their home, Steven Hammond (Son) started a backfire on their private property. The backfire was successful in putting out the lightning fires that had covered thousands of acres within a short period of time. The backfire saved much of the range and vegetation needed to feed the cattle through the winter. Steven's mother, Susan Hammond said: "The backfire worked perfectly, it put out the fire, saved the range and possibly our home". 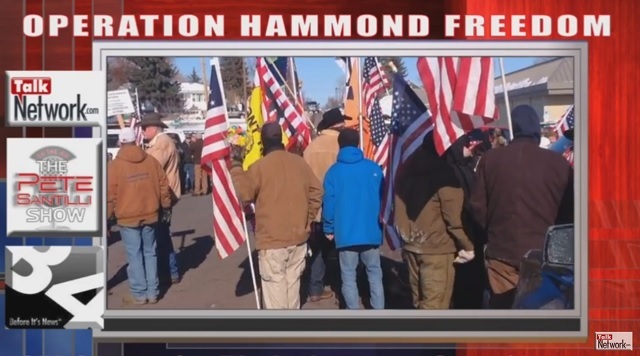 (j1) The next day federal agents went to the Harney County Sheriff's office and filled a police report making accusation against Dwight and Steven Hammond for starting the backfire. A few days after the backfire a Range-Con from the Burns District BLM office asked Steven if he would meet him in town (Frenchglen) for coffee. Steven accepted. When leaving he was arrested by the Harney County Sheriff Dave Glerup and BLM Ranger Orr. Sheriff Glerup then ordered him to go to the ranch and bring back his father. Both Dwight and Steven were booked and on multiple Oregon State charges. The Harney County District Attorney reviewed the accusation, evidence and charges, and determined that the accusations against Dwight & Steven Hammond did not warrant prosecution and dropped all the charges. (k) In 2011, 5 years after the police report was taken, the U.S. Attorney Office accused Dwight and Steven Hammond of completely different charges, they accused them of being "Terrorist" under the Federal Antiterrorism Effective Death Penalty Act of 1996. This act carries a minimum sentence of five years in prison and a maximum sentence of death. Dwight & Steven's mug shots were all over the news the next week posing them as "Arsonists". Susan Hammond (Wife & Mother) said: "I would walk down the street or go in a store, people I had known for years would take extreme measures to avoid me". (l) Shortly after the sentencing, Capital Press ran a story about the Hammonds. A person who identified as Greg Allum posted three comments on the article, calling the ranchers "clowns" who endangered firefighters and other people in the area while burning valuable rangeland. Greg Allum, a retired BLM heavy equipment operator, soon called Capital Press to complain that he had not made those comments and request that they be taken down from the website. Capital Press removed the comments. A search of the Internet Protocol address associated with the comments revealed it is owned by the BLM's office in Denver, Colorado. Allum said, he is friends with the Hammonds and was alerted to the comments by neighbors who knew he wouldn't have written them. "I feel bad for them. They lost a lot and they're going to lose more," Allum said of the ranchers. "They're not terrorists. There's this hatred in the BLM for them, and I don't get it," The retired BLM employee said. Jody Weil, deputy state director for communications at BLM's Oregon office, indicated to reporters that if one of their agents falsified the comments, they would keep it private and not inform the public. (m) In September 2006, Dwight & Susan Hammond's home was raided. The agents informed the Hammonds that they were looking for evidence that would connect them to the fires. The Hammonds later found out that a boot print and a tire tracks were found near one of the many fires. No matching boots or tires were found in the Hammonds home or on their property. Susan Hammond (Wife) later said; " I have never felt so violated in my life. We are ranchers not criminals". Steven Hammond openly maintains his testimony that he started the backfire to save the winter grass from being destroyed and that the backfire ended up working so well it put out the fire entirely altogether. (n) During the trial proceedings, Federal Court Judge Michael Hogan did not allow time for certain testimonies and evidence into the trail that would exonerate the Hammonds. Federal prosecuting attorney, Frank Papagni, was given full access for 6 days. He had ample time to use any evidence or testimony that strengthened the demonization of the Hammonds. The Hammonds attorney was only allowed 1 day. Much of the facts about the fires, land and why the Hammonds acted the way they did was not allowed into the proceedings and was not heard by the jury. For example, Judge Hogan did not allow time for the jury to hear or review certified scientific findings that the fires improved the health and productivity of the land. Or, that the Hammonds had been subject to vindictive behavior by multiple federal agencies for years. (o) Federal attorneys, Frank Papagni, hunted down a witness that was not mentally capable to be a credible witness. Dusty Hammond (grandson and nephew) testified that Steven told him to start a fire. He was 13 at the time and 24 when he testified (11 years later). At 24 Dusty had been suffering with mental problems for many years. He had estranged his family including his mother. Judge Hogan noted that Dusty's memories as a 13-year-old boy were not clear or credible. He allowed the prosecution to continually use Dusty's testimony anyway. When speaking to the Hammonds about this testimony, they understood that Dusty was manipulated and expressed nothing but love for their troubled grandson. (p) Judge Michael Hogan & Frank Papagni tampered with the jury many times throughout the proceedings, including during the selection process. Hogan & Papagni only allowed people on the jury who did not understand the customs and culture of the ranchers or how the land is used and cared for in the Diamond Valley. All of the jurors had to drive back and forth to Pendleton everyday. Some drove more than two hours each way. By day 8 they were exhausted and expressed desires to be home. On the final day, Judge Hogan kept pushing them to make a verdict. Several times during deliberation, Judge Hogan pushed them to make a decision. Judge Hogan also would not allow the jury to hear what punishment could be imposed upon an individual that has convicted as a terrorist under the 1996 act. The jury, not understanding the customs and cultures of the area, influenced by the prosecutors for 6 straight days, very exhausted, pushed for a verdict by the judge, unaware of the ramification of convicting someone as a terrorist, made a verdict and went home. (q) June 22, 2012, Dwight and Steven were found guilty of starting both the 2001 and the 2006 fires by the jury. However, the federal courts convicted them both as "Terrorist" under the 1996 Antiterrorism Act. Judge Hogan sentenced Dwight (Father) to 3 months in prison and Steven (son) to 12 months in federal prison. They were also stipulated to pay $400,000 to the BLM. Hogan overruling the minimum terrorist sentence, commenting that if the full five years were required it would be a violation of the 8th amendment (cruel and unusual punishment). The day of the sentencing Judge Hogan retired as a federal judge. In his honor the staff served chocolate cake in the courtroom. (r) On January 4,, 2013, Dwight and Steven reported to prison. They fulfilled their sentences, (Dwight 3 months, Steven 12 months). Dwight was released in March 2013 and Steven, January 2014. (t) In October 2015, the 9th District Court "resentenced" Dwight and Steven, requiring them to return to prison for several more years. Steven (46) has a wife and 3 children. Dwight (74) will leave Susan (74) to be alone after 55 years of marriage. If he survives, he will be 79 when he is released. (u) During the court preceding the Hammonds were forced to grant the BLM first right of refusal. If the Hammonds ever sold their ranch they would have to sell it to the BLM. (v) Dwight and Steven are ordered to report to federal prison again on January 4th, 2016 to begin their resentencing. Both their wives will have to manage the ranch for several years without them. To date they have paid $200,000 to the BLM, and the remainder $200,000 must be paid before the end of this year (2015). If the Hammonds cannot pay the fines to the BLM, they will be forced to sell the ranch to the BLM or face further prosecution. S* Rhonda Karges – Resource Field Manager for the BLM is the wife of Chad Karges Refuge Manager for the Malheur Wildlife refuge. Rhonda specifically deals with all the BLM issues relating to the area in and around Hammonds property including "grazing denial". Her husband just happens to be the person in charge of all the issues surrounding the Hammonds ranch such as "water and access". b* Soon after the water rights dispute the federal government influenced the State of Oregon to change their water law in favor of federal agencies. Wildlife is now considered in the State of Oregon as an accepted beneficial use for government agencies only. k* Being convicted as Terrorist made the Hammonds felons. They have been striped of their right to have guns. The Hammond live 53 miles from the closets town and have no practical way of defending themselves or their cattle. Several times they have watched baby calves be eaten by predators and could do nothing to prevent it. The abuses and corruptions affecting people like the Hammonds are symptoms of a more encompassing problem. Government employees (fulltime & elected) have changed their culture from one of service to, and respect for the people, to the roll of being a masters. On the subject of the land, it is evident that government employees are no longer assisting the people in claiming, using and defending property. Instead, they have become the people's competitor to the benefits of the land, and are willing to use force on those who they erroneously compete against. The federal government adversely controls over 582,000,000 acres of the western lands, 51% of the entire western land mass. They also have recently begun claiming over 72% of western resources such as the sub-surface minerals, forestry and waters. This is in comparison to 4.29% federally controlled land in the east. The impact of the federal government controlling the land and resources inside the western states is hard to calculate. The negative impact on the people can be seen economically, politically, and socially. In order for any people to survive, let alone prosper, it takes the land and resources to do it. Everything we eat, the clothing we wear, the homes we live in, the cars we drive, and so on, come from the earth. All physical comfort and prosperity originates from the earth. Individuals composing the federal government, understanding the origination of wealth, are reserving these resources for themselves and are willing to use force to retain them. The ramifications of their action are slowly forcing the people of the west into poverty. Due to the fact that people cannot survive without land and resource, the federal government's action in administering the lands for their own benefit will be the cause of public discontent and unrest until it is corrected. The solution is very simple, the land and resources must be made available to its rightful owners, the people. This can be done peacefully if the states & counties would check and balance the federal government as designed. When this happens, the people will begin to prosper and much of the economical, political and social problem of the west will diminish. Prosperity, peace and tranquility will be the results.